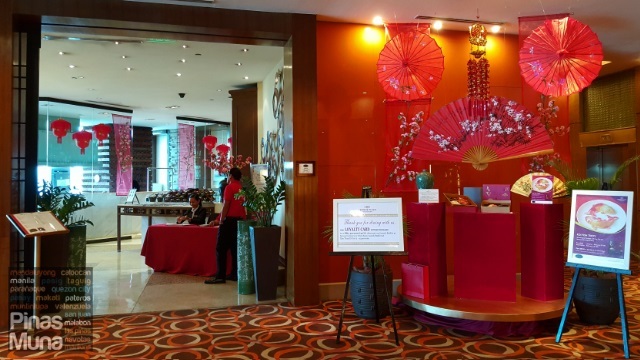 Xin Tian Di, the premier Chinese restaurant of Crowne Plaza Manila Galleria, rolled out its auspicious set menus which families and friends can enjoy together to welcome the Year of the Fire Monkey. Behind this new and exciting culinary offering is the hotel's new Executive Chinese Chef Peter Yeung. It has become a tradition for PinasMuna to welcome the Chinese New Year at Xin Tian Di. This year, we were treated with contemporary Cantonese dishes with fusion of Western taste and cooking techniques. Dishes prepared by Chef Peter are also prepared with healthier ingredients without sacrificing taste. We started our lunch with the Yu Sheng (鱼生) salad, which is raw fish salad mixed with shredded vegetables and seasoned with various sauces and condiments. It is also known as Prosperity Toss salad because of the procedure of which the salad was made, that is to toss all the ingredients using chopsticks. This tradition originated from Singapore and it is believed to bring more fortune and long life to all those who participated in the ritual tossing of the salad. Appetizer was followed by a soup dish called Sheng Yi Shing Long (生意興隆) which is believed to bring prosperity to one's business. It is made with lobster and crab roe in bamboo fungus soup. The lobster tail was very meaty while the crab roe added more flavor to the soup. Next to be served was the Bu Bu Gao Sheng (步步高升) which is said to enhance personal fortune. The wok fried diced beef was very tender and had a lightly sweet savory taste. It is served with diced dragon fruit and macadamia nuts glazed with kongpao sauce. A fish dish called Nian Nian You Yu (年年有餘) is then served which is made of steamed traditional style silver cod fish served with organic brown rice wrapped in beancurd skin. The dish is said to enhance abundance. Finally for dessert, we had the Tian Tian Mi Mi (甜甜蜜蜜) a sticky rice dumpling served in a cup of wild honey tea infused with pink rose bud. This dessert is believed to bring blessedness and cheerfulness. 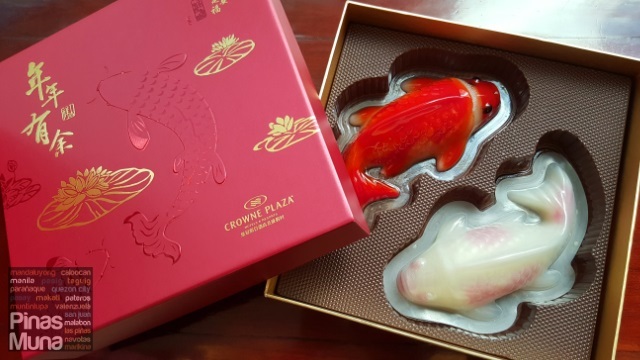 The Auspicious Chinese New Year Set Menus are available until February 10, 2016 only. Guests dining on February 7 and 8 will get a chance to pick their lucky Ang Pao and may win exclusive treats from Crowne Plaza Manila Galleria. No Chinese New Year is complete without Tikoy (Nian Gao). Xin Tian Di's signature Koi Fish Tikoy is available for pre-selling until February 8 at Xin Tian Di for only P1,088++. Avail of this special offer now and you will receive a Loyalty Card which comes with a 50% discount on a lunch buffet for 2 to 4 persons at Seven Corners, or a 50% discount on a Dim Sum Lunch Buffet for 2 to 4 persons at Xin Tian Di. For inquiries and reservations, you can call +63 (02) 633-7222 or email fandb.reservations@ihg.com.